These holy Martyrs confessed during the reign of Diocletian and Maximian in the year 290. Of them, Saint Hieron was from Tyana in Cappadocia, a husbandman, of great bodily strength and high nobility of soul. As he was at work digging in his field, certain soldiers came to impress him into military service. He, however, not wishing to keep company with the impious, refused, and with his wooden tool alone drove away the armed soldiers, who fled in fear because of his strength. Later, however, he went of his own free will, and confessed Christ before the governor. His right hand was cut off, and he was imprisoned with thirty-two others, whom he strengthened in the Faith of Christ. Together they were all beheaded outside the city of Melitene in Armenia. The choir of Martyrs, shining far and light-bearing, hath dawned today and with the bright shafts of wonders hath made the Church resplendent with noetic light; wherefore, as we celebrate their most solemn remembrance, O our Saviour, we entreat that through their intercessions Thou rescue us from dangers of all kinds, as the most merciful God and the Friend of man. 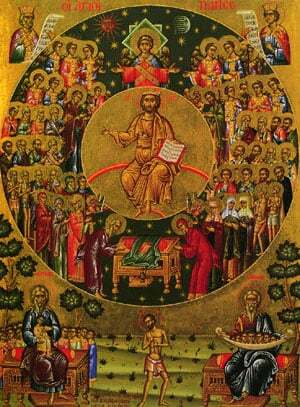 Share the feast of 33 Martyrs of Melitene with an icon greeting ecard.